Bigfoot, the Loch Ness monster, and El Chupacabra are all creatures that are regulated to myth. They have been ignored by mainstream science and those who do seriously study these creatures are often accused of chasing unattainable goals. Hard evidence for these cryptids (animals whose existence is believed by some but is unrecognized by the scientific community) is few and far between. These ten pictures are famous examples of supposed photographic evidence of the existence of mythical monsters. The famous “Surgeon’s Photo” of the Loch Ness Monster has become one of the most iconic images of the century. It is probably not just one of the most famous monster photographs ever taken, but one of the most famous photos ever. The story goes that Dr. Robert Wilson, a gynecologist not a surgeon, was admiring the beauty of the loch when he saw a beast rise out of the water. He quickly grabbed his camera and began taking photographs. Wilson developed his photos and the clearest image was the photo seen above. Controversy surrounds the photo, these controversies are further explored in this article. Similar to the Loch Ness Monster, Lake Champlain in North America has its own sea monster to contend with. Amateur photographer Sandra Mansi released this photo in 1977. The spot where the photo was taken is reported to be shallow waters (roughly about 14 feet deep) causing many to suggest that the photo is of a floating tree or is simply a hoax. The photo gained some clout though in 2003 when the Fauna Communications Research Institute recorded a sound that was similar to that of an Orca’s call, but had several differences that made it unidentifiable. This has led many to view this famous photo differently and instead of the neck of a plesiosaur-like lake monster, they are now seeing the fin of a large unknown whale-like creature living in the lake. Kasai Rex is a supposed carnivorous dinosaur that some how survived the mass extinction event of the Crustaceous and lives undetected to this day in Africa. The story goes that a Swedish explorer was on an expedition in the Kasai Valley of the African Congo. The group was trying to sneak past a rhino without detection when a tyrannosaurus-like creature sprang from the underbrush and attacked the rhinoceros. 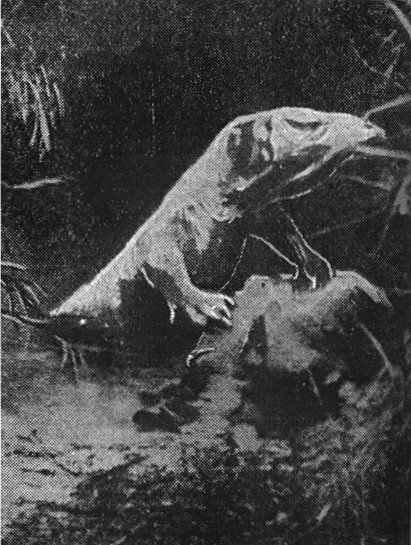 There are actually two photographs that exist of the creature and both show very different depictions. The photos are less famous for being authentic and more famous for being hilariously fake. I felt like they should be included on this list because they are ‘famous’ monster photographs that were at one time passed off as real in some circles. This photo was taken in the British Isles and is purported proof that non-indigenous cats, possibly a population of puma, lynx, or black leopard are living and breeding in Britain. The photo is backed up by eyewitness testimony and even reports of attacks. Also, big cats have been killed in the UK but they are usually chalked up to one off escapees from collectors or the zoo. This photo, though, suggests that they are roaming the wilderness and surviving. François de Loys was searching for oil on the borders of Columbia and Venzualia. The expedition lost many lives to disease and skirmishes with natives. Of the twenty people on De Loys’ team only four returned. According to De Loys while camping his expedition team encountered what he at first thought to be two bears. Upon further observation his team discovered they were not bears, but two large primates, one male and one female. The two strange animals began howling at the group and flinging feces at them. Someone in De Loys’ camp shot and killed the female causing the male to flee back into the jungle. 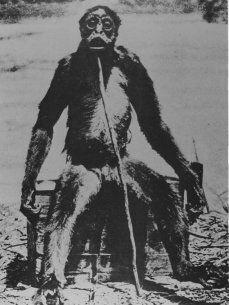 The above photo is a supposed picture of De Loys’ mysterious ape. This photo and similar photos of other strange hairless dogs have made the rounds on news networks and the Internet for the last couple of years. 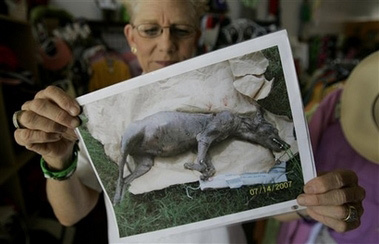 The photo above is of what some believe to be the infamous Chupacabra (Mexican Goat Sucker). The corpse of this strange animal was found on the side of a road in Texas. It was recently discovered though that these hairless dogs with fangs are merely a rare breed of dog called Xolo. It seems that there is a population of feral Xolo in Texas. An anonymous woman mailed these photographs to Sarasota Sheriff’s Department in Florida. Accompanying the photos was a letter saying that this strange ape-like creature had been in her backyard on several occasions stealing apples out of a basket on her porch. She was convinced that the animal was an escaped orangutan, but others believe that this is photographic evidence of a Bigfoot like creature that is native to the Florida wilderness known as the skunk ape. Thunderbird is a large flying creature that has its roots in Native American folklore. According to the Lakota people thunderbird was a physical manifestation of Wakan Tanka, a figure similar to the Judeo-Christian God. Today many people believe that this creature still exists and is actually a living relative of a prehistoric Pterosaur. The above photo was created for a paranormal television series, but it is a replica of a photo that many remember seeing but has since been lost to time. The photo first appeared in an Arizona newspaper when a group of men shot down a large serpentine creature with wings. Many researchers recall seeing the photo but all searches to find the original picture have proven to be frivolous. This photo was first presented to an Australian magazine in 1965 by Robert Le Serrec, a professional photographer. Serrec said that it was a genuine photograph of a sea serpent. 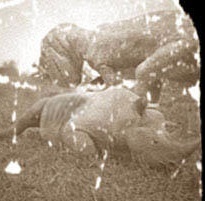 Printed with the photographs was a lengthy story about the family who took the picture of this strange creature. It is said that the family was vacationing near the Great Barrier Reef. The giant (reportedly 75-85 feet long) tadpole-like creature was reportedly resting on the bottom of the lagoon nursing an injury when the photo was taken. Rick Jacobs took this photo in the Pennsylvania area of the United States. Jacobs believes what he has captured on film is an adolescent Sasquatch. Many are not as quick to say that this is a photo of an unknown prime ape. 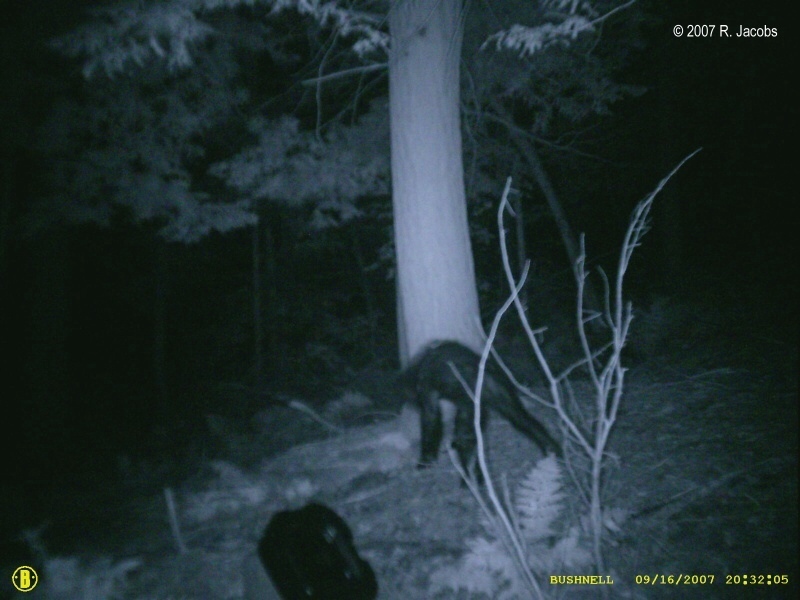 Skeptics have pointed out that bears with the mange have a very similar appearance to what Jacobs have caught on film, but Bigfoot proponents believe that this is the best evidence in years that there is an unknown prime ape in the wilderness of North America. These ten famous photos are examples of what could possibly be proof that the creatures that most believe are regulated to myths and legends are reality. They could also be just simple hoaxes. The line in the sand between believers and skeptics is sharply drawn, and the debates, I am sure, will never end.